Kevin was a runner, dragon boater, artist, car fanatic, musician, husband and father. He was truly a renaissance man, if not a raconteur. Kevin was a quiet rebel; he was not a man you could easily pigeon hole. 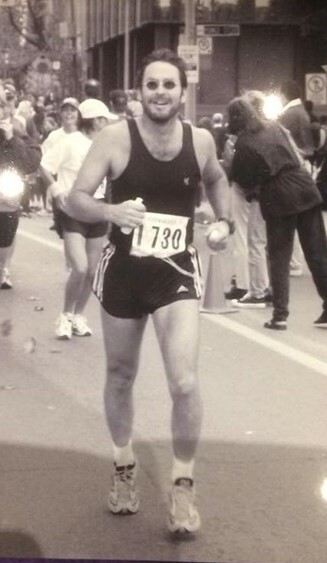 Kevin did not actually start running until he was 30 when he ran his first marathon. Not being a man who tackled any activity in a small way, he decided not only to keep running but to set a goal of running 50 marathons by the age of 50. When he joined Longboat in 1990, he had already run 27 of them. He achieved his goal two years ahead of time and just kept right on going. His last marathon, his 60th, he completed in Barbados in 2002. Actually, that was his 15th marathon in Barbados. He also ran Boston twice and New York once. His best marathon time was 3:03 in 1988. Besides marathons, Kevin also ran Around the Bay, and pretty well all the other usual shorter distances, in addition to a 50 km race. Kevin was famous in Longboat for ignoring the advice of fellow runners to take the time to recover after a marathon. For four years running, he ran the Waterfront marathon, the Toronto International two weeks later and the Niagara Marathon a week after that. For five years, Kevin was on the Longboat dragon boat team, Wildfire, also designing its singlet. This is a nice segue into Kevin’s contribution to Longboat as an artist. He designed many of Longboat’s race shirts, often using images of Toronto, the Toronto Islands and those honouring the club’s connection to the First Nations community. Many members treasure those wonderful shirts. He also designed a medal for the club. Kevin was also a car lover, not new cars. Vintage cars. Ok, junkers. He loved working on cars. He once had eight cars on his property. He believed it was better to have eight $100 cars than one $800 car. His favorite cars were his Trans Am and a Triumph Spitfire that he had dropped a Toyota six into. And then there were the motorcycles. With his love of cars and his gonzo, take no prisoners running philosophy Kevin earn the moniker “The Road Warrior”. In the final few years of his life he was having trouble running and talking. Kevin said he was running like Frankenstein. After many tests, Kevin received the diagnosis of ALS, amyotrophic lateral sclerosis, also known as Lou Gehrig’s Disease, a progressive neuromuscular disease. It slowed him down, but it didn’t stop him. He participated in the Bread and Honey and the New Hamburg 8 km Classic. He cycled solo to Ottawa and then later with his son Bob. He was on the three-man team at Around the Bay with Valerie Alston and Allen Groome. Kevin walked the last 10km using his putter as a cane and holding his wife Melanie’s hand. Valerie and Allen walked beside him. As they slowly got closer to the finish line more and more Longboaters walked with him. Longboat has an award honouring the spirit of Kevin, who died in 2006. The Kevin Hayes Road Warrior Award – This award recognizes members who run an exceptional kind of race or numbers of races. By Roger Moss with input from Tina de Geus & Allen Groome.